How to define, change categorized, and default Due Date Period in Library Software by PrimaSoft. Ask a question, report problem, ..
Question/Topic: How to define/change categorized/default Due Date Period(s) ? On the File menu, click Load Database. Select and load Library database. 2. How to define/modify library Default Due Date Period? How to define library Categorized Due Date Period? 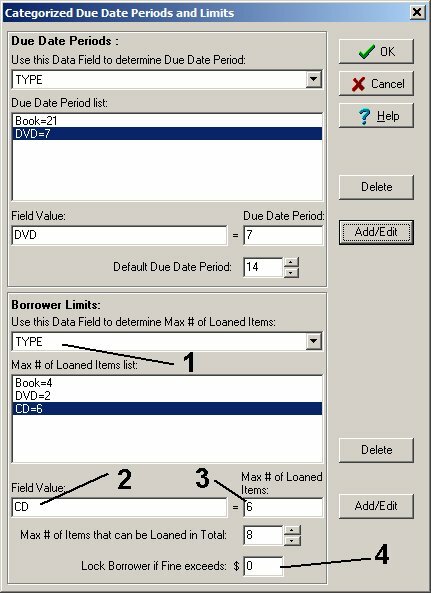 Enter the value of the field into Field Value (2) edit box (for example: CD), enter the number of days the item can be loaned in the Due Date Period (3) edit box. Click Add/Edit button to add the setting to the Due Date Period list. Repeat this procedure for other types that do not use Default Due Date Period. Note: Default Due Date Period (4), this value will be used if you do not define categorized due date periods. To change Default Due Date Period (4) just enter a new value into this box. When you click OK, all new settings will be saved and active. 3. How to define/modify borrower limits, how to lock borrower? 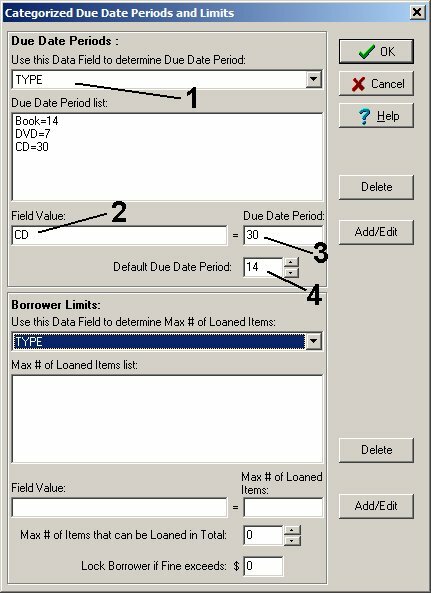 Enter the value of the field into Field Value (2) edit box (for example: CD), enter the number in the Max # of Loaned Items (3) edit box. Click Add/Edit button to add the setting to the Max # of Loaned Items list. Repeat this procedure for other types. With this program you can lock borrower if his or her fines exceed a defined limit (4). If the value is $0 it means there is no fine limit defined. 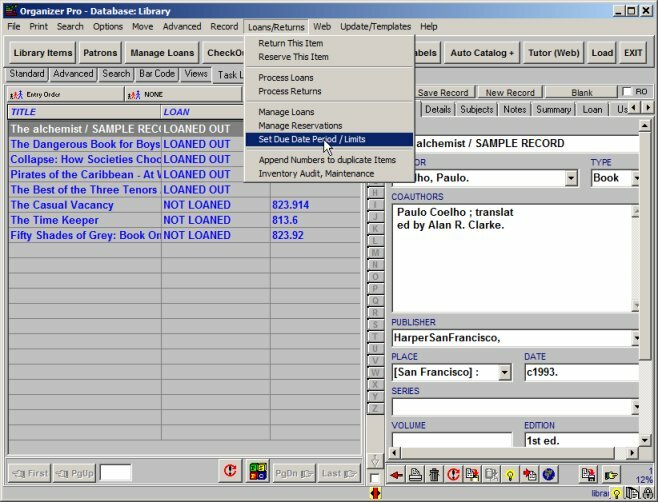 The warning window will be displayed when a locked borrower is trying to loan a library item. You can upgrade your library solution: Library Upgrade. How to define/change library loan limits ? How to define Barcode and Fine functionality? How can I change the due date so that employees can have items checked out for 6 months at a time? Copyright © PrimaSoft PC, Inc. All rights reserved.